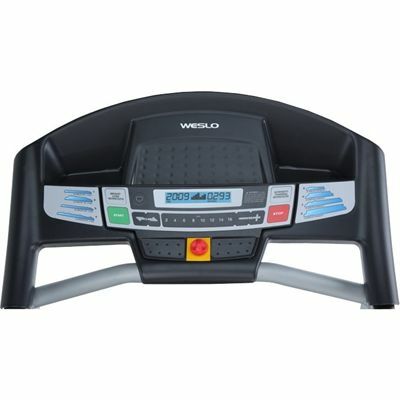 The Weslo Cadence treadmill provides feedback through the LCD screen on the console. This is divided up into three sections. On the left display, exercise time and theoretical calorie consumption are displayed in rotation as well as the current incline (displayed whenever the incline is changed). The middle of the displays shows a quarter mile track to demonstrate distance being covered in a visual fasion. The right hand segment of the LCD rotates between the distance covered in the run and the speed. Another handy feature of the console is the selection of direct speed keys that enable the running belt speed to be changed with a single press (2, 4,6,8, 10, 12, 14, 16kph). Pulse measurement is carried out by standing on the anti-slip footrails and using placing the thumb on the pulse sensor on the console. After approximately 15 seconds, the measured rate is displayed. The 8 programmes are split into two groups of 4 programmes. The first group are weight loss programmes and consist of two 30 minute programmes, one 35 minute and one 45 minute programme. The second group are intensity training workouts that vary in duration from 20 minutes to 45 minutes. 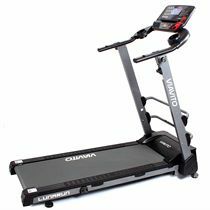 These programmes automatically adjust the speed and incline of the treadmill and the programme profiles are printed on the console. The Weslo Cadence 21.0 has a folding mechanism with a side locking latch to secure the running deck in place when folded and also has transport wheels. 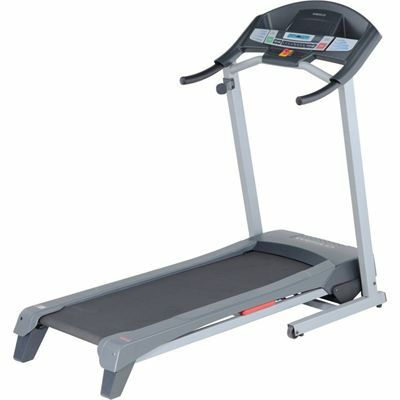 for submitting product review about Weslo Cadence 21.0 Folding Treadmill.